Looking ahead to the linked stories in Who Do You Think You Are? readers might recall her earlier collection Lives of Girls and Women. Alice Munro has consistently said that it wasn’t in her to write a novel, but these collections of linked stories could work as introductions to her work, for those readers who aren’t comfortable with short fiction. After reading this first, oft-anthologized story, “Royal Beatings”, readers familiar with her stories might also recall “Red Dress” and “The Ottawa Valley”; they also examine the complicated relationship between women and the children they raise, between girls and the women who shape their lives from above. In this volume, Flo and Rose appear consistently throughout, and Rose (like Del, in the earlier collection) grows up on the page, there for readers to see. In “Royal Beatings”, Rose is still young, young enough to be beaten. But in typical Munro style, the story is not simply about Rose’s beating. First, Rose must introduce readers to Flo. Because readers must not assume that Flo is her mother. Rose’s mother died, and Flo married Rose’s father. Technically speaking, Flo is Rose’s step-mother, but for Rose, Flo is simply Flo. Flo tells the story of Rose’s mother’s death with a slant that irritates Rose. Apparently her mother had said, the day that she died, that she had an indescribable feeling, “like a boiled egg in my chest, with the shell left on”. But, when Flo tells the story, “she made the comparison sound slightly foolish, as if her mother really was the kind of person who might think you could swallow an egg whole”. Readers can capture the cadence in this first paragraph, even without any quotation marks; the italics and the repetition get the point across the prose effortlessly. And then Rose turns Flo’s words into something “savage and splendid”; she takes Royal Beating and imagines a scene in which a beating victim gets the royal treatment, with blood “leaping out like banners” on a tree-lined avenue with formal spectators. She makes Flo’s statement sound slightly foolish, if only in her mind. The pretense and theatrics are present not only when Flo tells the story about Rose’s mother’s death, but when she fetches her husband (Rose’s father)and demonstrates the necessity of punishing the girl, when she prepares plates of food and treats for Rose after she has retreated to her room, when Flo appears to be contrite and remorseful. It’s not only Flo who pretends. The entire family pretends, for instance, that the people who are using the bathroom, which is off the kitchen, who are making all sorts of bathroom noises, are not the people who come out. “So no one ever ever seemed to hear, or be listening, and no reference was made.” And they pretend at other things as well. That’s how it is in an Alice Munro story. A single paragraph about bathroom noises is layering the theme of intimacy and privacy, revelation and violation. But of course readers aren’t limited to reading between the lines. There is an actual beating. Readers learn that Old Man Tyde, who had apparently beaten his children and his wife, was badly beaten by a group of men from town “in the interests of public morality”. Flo tells Rose the story. Her face goes “soft and thoughtful, tantalizing, warning”. Although intended as a warning, the man dies from this beating, and the perpetrators are punished for the murder with a token sentence, because the influential men in town condoned their actions. Flo is indignant that they were not adequately punished for their crime. And readers must reconcile her indignation with the role Flo plays in orchestrating Rose’s Royal Beating. Readers can experience the pomp and glory for themselves, and must unravel the degrees of power and powerlessness (in Rose, in Rose’s father, in Flo), actual and perceived, in the act. It’s a pleasure to unravel the details of an Alice Munro story, even when the story itself is a painful one to read. The scuffs of dirt on Flo’s knees, which Rose manages to shame her over, even on the cusp of these horrors. The intricately drawn, handmade sign on the shop’s door, which Rose made for Flo, and which is turned to read ‘Back Soon’ when Rose gets a beating; of course people outside can hear what’s happening, but the sign is intended to operate like that closed bathroom door. The intersecting pattern of the kitchen floor, the geometrical arrangement, the way in which lines intersect. And readers cannot help but feel Rose’s pain, though at the end of the story readers realize how many years have passed since this happened. It is not said, “no reference is made”, but it is clear that Rose’s pain lives in her chest, “like a boiled egg…with the shell left on”. 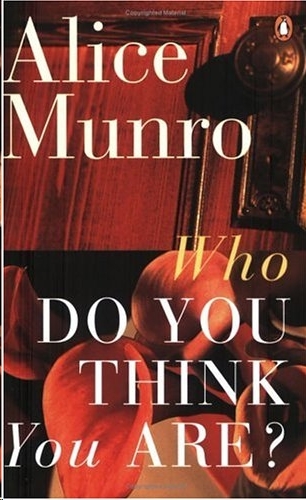 Note: This is part of a series of posts on Alice Munro’s story collection Who Do You Think You Are?, which will continue on subsequent Thursdays. Please feel free to join in, for the series, or for a single story. Next week: “Privilege”. My Alice Munro reading project began with Dance of the Happy Shades, followed by Lives of Girls and Women, and Something I’ve Been Meaning to Tell You, and I aim to read through her work to date. She is one of my MRE authors. It is the first story in Who Do You Think You Are? and the collection is also titled The Beggar Maid in other countries; they are available as e-books and print-books. In the anthologized collections, Royal Beatings often appears as well. Good luck! Ryan and Niranjana: I’d forgotten just how GOOD it is! Nice to have company in admiring her individual stories. My favorite Munro. I read this at least once a year. I have a real soft spot for Alice Munro. Haven’t read her in years. Thanks for reminding me.